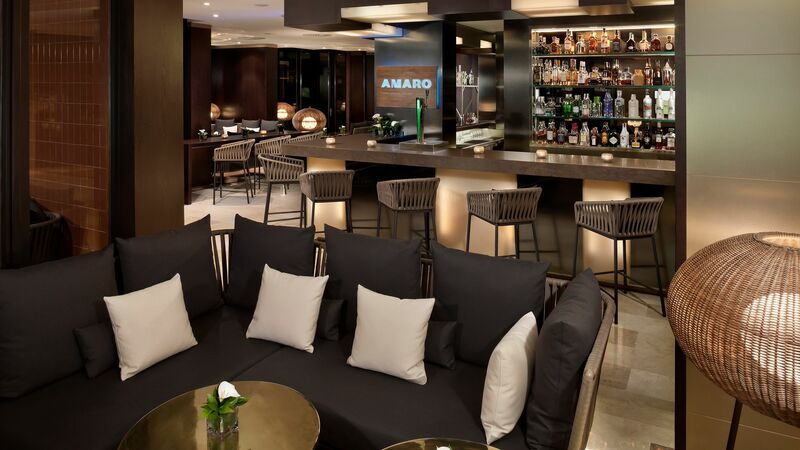 Gran Melia de Mar is the perfect place for couples wanting to relax and get away from it all. The hotel is located in Illetas and overlooks the Mediterranean Ocean from its chic exteriors and luscious gardens. Palma is just a short car ride away and is perfect for those wanting to indulge in retail therapy, take in the yachts in the harbour and soak up the history and culture of the island’s cosmopolitan city. Spend your days relaxing in cabanas in the gardens or sampling some of the excellent cuisine. Arrels Restaurant serves tasting menus which will take you on a culinary journey through Mallorca in seven courses. Meander from the salt flats and ocean through olive groves and orchards to the rugged internal mountains as you taste these succulent local dishes. This hotel does not accept children under the age of 15 years. The hotel has 142 rooms. The hotel’s expert chef will take you on a culinary journey through Mallorca with fresh local produce from the orchards, salt flats, Atlantic and farmlands of the island. Lunch and dinner consist of a seven course tasting menu, which changes daily. 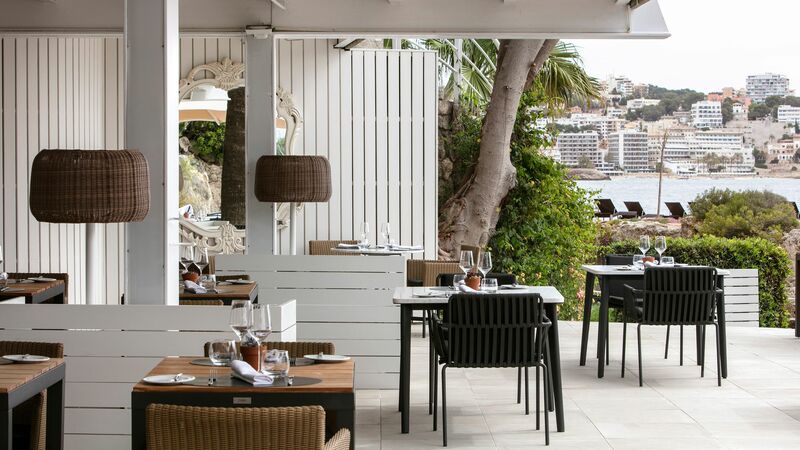 This chic terrace offers a programme of live music events, including jazz and piano, as well as a menu including tapas, pastries and cocktails. Overlooking the Gran Melia de Mar’s swimming pool and the ocean, soak in the sun and enjoy classic Mediterranean dishes, fresh seafood and cocktails. Take in views of the Mediterranean on this elegant al fresco terrace where you can enjoy breakfast buffets with show cooking stations. A la carte dinners include fresh fish, rice and salads. 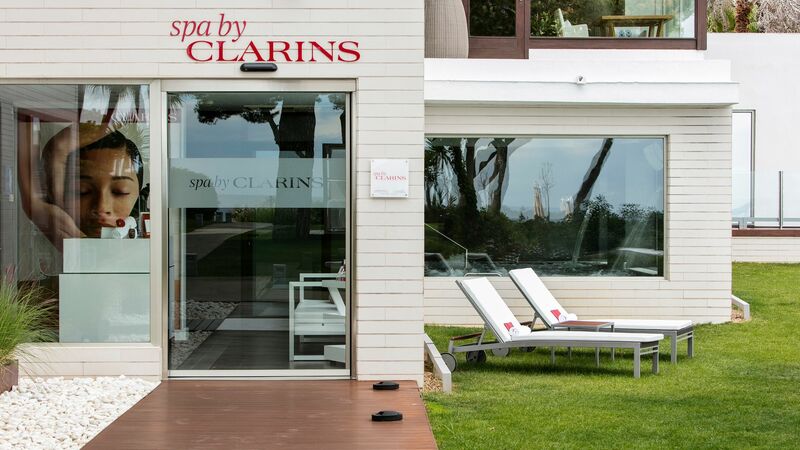 Leave the spa feeling rejuvenated and relaxed at the hands of expert beauticians and Clarins. Treatments include luxury facials, massages and water rituals. 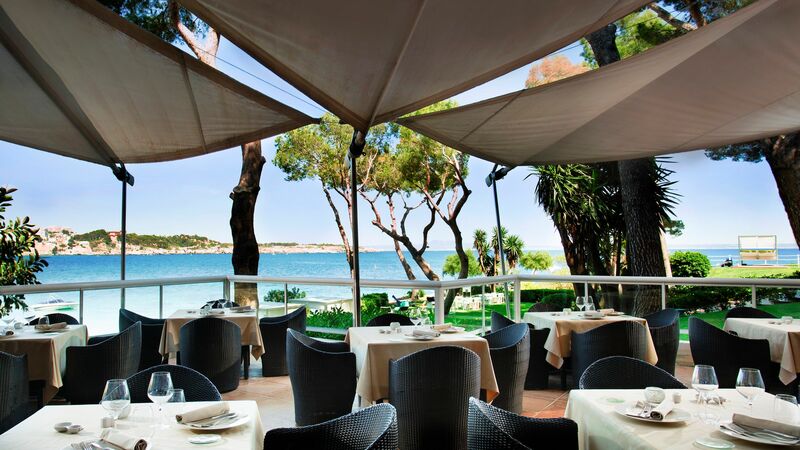 Gran Melia de Mar can be found in the pretty village of Illetas, just 20 minutes from Palma. Known to be one of the island’s swishest towns, Illetas offers a beautiful stretch of beach, luxury hotels and some excellent restaurants. The rocky coastline and pine forested hills surrounding the town make it perfect for explorers to see by bike or on foot, while those wanting to enjoy the upmarket shops and eateries have plenty of choice. If you’re looking for something livelier, the island’s capital, Palma, is just 20 minutes away. Here you’ll find a swanky marina full of yachts, designer shops and boutiques, as well as a selection of bars and restaurants. It’s steeped in history too, with a visit to the cathedral a must for culture lovers. Gran Melia de Mar is a 20 minute drive from Palma de Mallorca Airport. Double Deluxe Sea View rooms are contemporary in design and offer a furnished balcony, sofa, flat-screen TV, marble bathroom with bathtub and separate walk-in rain shower and luxury Clarins® amenities. The rooms also have a Nespresso® coffee machine, complimentary WiFi, pillow menu, safe, hairdryer, bathrobes & slippers and a minibar. Guests can upgrade to include Redlevel service for a supplement. Grand Suites Red Level feature a bedroom, spacious lounge with designer furniture and a leather sofa, writing desk and two terraces both with individual access to the lounge and bedroom. The marble bathroom has a walk-in shower and separate bathtub as well as Clarins® bathroom amenities. Redlevel rooms are positioned in a privileged location with wonderful views of the Mediterranean Sea. Guests will benefit from a host of exclusive benefits including; access to the 24-hour Red level lounge with daily continental breakfast between 09:00-11:30, water, coffee, tea and culinary delights throughout the day, a selection of drinks from the open bar and an aperitif service between 18:00-20:00, Sweets & Energy Bar with a selection of non-alcoholic drinks, wine and cava between midday-17:00, VIP check-in, Nespresso® coffee machine with unlimited capsules, a selection of teas, daily newspaper, laundry of two items per room per day (excluding dry cleaning), professional hairdryer & straightener, welcome gift, free access to the SPA by Clarins® hydrothermal circuit, 1 Bali bed day in the exclusive Sky Pool area (when staying a minimum of 3 nights). Junior Suite Red Level rooms feature a bedroom, lounge with sofa, flat-screen TV and two private furnished balconies as well as the other facilities listed above. Red Level rooms are positioned in a privileged location with wonderful views of the Mediterranean Sea. Guests will benefit from a host of exclusive benefits including; access to the 24-hour Red level lounge with daily continental breakfast between 09:00-11:30, water, coffee, tea and culinary delights throughout the day, a selection of drinks from the open bar and an aperitif service between 18:00-20:00, Sweets & Energy Bar with a selection of non-alcoholic drinks, wine and cava between midday-17:00, VIP check-in, Nespresso® coffee machine with unlimited capsules, a selection of teas, daily newspaper, laundry of two items per room per day (excluding dry cleaning), professional hairdryer & straightener, welcome gift, free access to the SPA by Clarins® hydrothermal circuit, 1 Bali bed day in the exclusive Sky Pool area (when staying a minimum of 3 nights). Save up to 20% on the hotel price for holidays between 17 April - 26 October 2019 booked by 31 March 2019. Honeymooners will receive a gala dinner for two, a bottle of local Cava and fruit upon arrival and a complimentary upgrade to Superior accommodation (subject to availability) when staying for a minimum of 5 nights, wedding certificate is to be presented upon check in and should not be older than 2 months. The property isn?? ?t actually in the centre of Palma but in a trendy western suburb by the sea. It only actually a 15-minute drive to get into the historic centre (which is lovely). The hotel feels very modern and all the rooms have balconies with the most amazing sea view. There are a couple of swimming pools and also a lovely little secluded beach with a little cove which is perfect for swimming. The spa in the basement is amazing, they have a series of showers from around the world which you can try (basically involve mist and been sprayed at different angles). The hotel feels half resort half city/corporate hotel - but might not be for everyone. Apart from the restaurant across the road ( which is great btw) the area is a little dead so a car is a good idea. We have been staying at the hotel for a couple of years, managing to get there a couple of times each year. The rooms are lovely, the facilities great and the service has always been good for us. There are two things we would like to see changed... The sun loungers round the pool continue to be reserved by guests despite a notice asking for them not to be. From our room at 8am, we could see a line of 6 all with magazines and books on. By the time we came down after breakfast, around 10.30, they were still there and still empty. Eventually the guests rocked up just before midday. This happens all the time, we have also seen the same (British) guests claim their beds day after day, and not turn up until the morning is virtually over. It's just not fair to those who have good manners. Please look in to this for 2019. The second thing? Please put better lighting in the lifts, you get ready to go out, think you're looking nice and rested in the mirror in you room, then get in to the lift and look 105! See you next year! Ninth visit to this hotel and prob be our last! Very disappointed! Wrote formal complaint to ???Esther??? head of customer experiences totally ignored. No pool bar, no pool restaraunt, no pool service, whole hotel in pre shutdown mode subdued and under staffed. Miss sold our stay, ruined our trip! I've visited Illetas and different hotels for many years but was offered such a good deal in The Gran Melia that I couldn't resist. There is such a calmness and serenity about the place and great views across Palma Bay. Direct access to the sea was a bonus and to be able to listen to the waves lapping against the shore during the night was lovely. Can't wait to return.